Born in 1976. Graduated from the University of Tokyo, Graduate School of Engineering (Architecture). After practicing in Kengo Kuma & Associates and Architects 49, co-found On Ground in Bangkok. Since 2012, acting as representative of PLANTEC GROUP (THAILAND) and international committee of The Association of Siamese Architects Under Royal Patronage. With the outstanding growth recently in ASEAN countries, you must have frequently heard the word “AEC”. Aimed to start in 2015, the concept of ASEAN Economic Community is on process of framework study. The characteristics of AEC are following; 1.Single market and production base, 2.Competitive economic region, 3.Equitable economic development, and 4.Integration into global economy. Unlike well-known FTA that focuses only on goods, AEC also targets on regional integration to promote the free movement of service, investment and human resources. This epoch-making and ambitious framework promotes competitions in the region and it will also help shaping attractive markets full of business chances in every field. In addition, the point to be concerned once the free movement or exchange begins is cross-cultural certification system in specific professions. Those occupations include not only doctor, dentist, nurse, accountant and engineer but also “architect”. It is not exaggeration to say that building/construction industry can no longer ignore other business. In modernization period, the master plan of Thailand development was made by many foreign advisors from Italy, Germany and so on. Those numerous existing infrastructure and buildings developed as urban elements and established as a part of culture in the country. However, architect is a type of business that the working of foreigner is regulated according to the current Labor Standard Law. Looking from Thai side, architect profession is highly protected. On the other hand, there are a number of Thai architectural firms working for projects in neighboring countries such as China, Singapore, Malaysia, Vietnam and Cambodia. Nevertheless, many architects are also against the idea in fear that the long-preserved Thai projection will be greatly affected by intrusion of architectural firms from countries like Singapore and Malaysia when AEC concept becomes real. Careful discussion is now repeated that while blending ideas of each country with various gaps to remain in ASEAN, it is a big chance for Thailand to evade from Semi-Developing countries. With its geographical advantage, Thailand has taken the key role in this framework. LCC (Low Cost Carrier) industry has become more active to the level that those in Japan cannot compare to. The transportation within the region has become more rapid and convenient to an extent that can match with Japan. The expansion of network by North-South and East-West economic corridor that attempting to cover the GMS (Greater Mekong Sub-region) plays important role as a catalyst that makes business industries and academic institutes of each nation become more attractive and centralize resources in strategic cities. With this economic growth the presence of local industries in the global stage is becoming more prominent. Subsequently, this approach is worth bringing to our attention from now on. It is certain that investment and convenience will be increased for Japanese companies that have production and service base in ASEAN countries. In the meantime, the relationship between each ASEAN country and Japan will be deepened while the movement of networking in the area is crucial to the growth of Japanese architecture world. With the urgent theme in demand of new market in abroad, we can widen the world through the stage of this activity and from now on there is likely a rising chance to be involved in international projects based in Thailand. The Japan Institute of Architects (JIA) and the Association of Siamese Architects under Royal Patronage (ASA), which deepened their ties for generations, promote preparations on practice of exchange program that accept young blood architects who have different cultural background from each country staying in architect firm for professional work experience. In JIA Yokohama 2012, MOU for “Exchange Program for Architects between Japan and Thailand” was signed between both organizations of architects and the selection stage of participated architectural companies and trainees is on process at present. It is expected that this challenging program will lead to discovery and upbringing of talented architects for the future through the activity and interchange of young generation who aim to become architect or those who pay attention to the big world. Currently in Bangkok, the insecure political situation that once used-to-be a hot topic also in Japan has settled down and the economy has regained its liveliness. 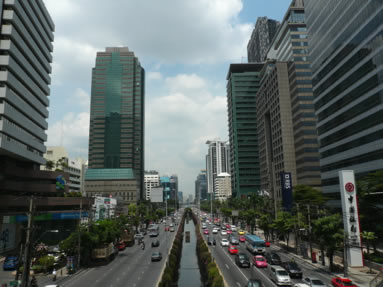 The opportunity to be engaged in project of various genres has risen by the construction rush of skyscrapers and large-size commercial facilities. Moreover, the restoration of Japanese manufacturing industry in Thailand that greatly hit during flood disaster in 2011 is almost completed. As it turned out, the rapid increase of Japanese companies advance more rapidly to Thailand in spite of the rumor of withdrawal and avoiding China risk. Therefore, many Industrial Estates in suburb of Bangkok, where is the large base of Japanese manufacturing industry, continue further expansion. Because the relationship between two countries has deeply rooted until now, you can sense more unique experiences in local affairs through the different circumstance and culture. These activities broaden the chances of architects and the number of Japanese architects who participate in Thai architecture world will be increases. Hopefully, these exchanges will be a starting point to initiate the movement of AEC mentioned above. In Japan, it is rare opportunity to meet up-to-date information of Thai architecture. However in cultural exchanges, Thailand is one of the most familiar countries for Japanese through plentiful reports by media and travel experiences. Japanese cars, consumer electrical appliances and eating habits have fully rooted in the life style of local community. As a matter of fact, there are approximately 50,000 Japanese residents in Thailand and Japanese school in Bangkok has the longest history in the world and world’s largest number of students. And it is understandable that Japanese community has firmly blended into a part of local culture. Considerably influenced by similar religious base as Buddhism, it can be said that Thailand is a country with high affinity to Japan if comparing with other neighboring countries. Various facilities with catchphrase of Japanese brand are increasing everywhere in the city and there is a boom of rapid increase of tourists from Thailand in recent years. Not only architecture, the tendency to catch up the latest Japanese information with keen interest also shows high expectations for Japan. In the architecture field, Japanese companies such as general contractor that has expanded their business in Thailand for a long time also have been receiving strong reliance from their clients and also local community. It is undeniable that the service cost of Japanese companies is comparatively high but they are still being chosen simply because they can assure the satisfaction of their clients. Furthermore, whether it is in the design process or in the construction process, the unexpected troubles always come to light in any stage as a daily occurrence. But to efficiently solve those problems and gain trust from the clients, know-how and strong management that helps the clients achieved high quality of works whereas still keeping on the schedule is essential. Moreover, it is commonly known that the local clients are seeking to commission a Japanese company because they are expecting the utilization of the most advance technologies, which are fundamentals of all strength. To establish an effort in the region and to be able to face each other from the same standing points, we share the feeling of trust from several levels where joint venture starts to emerge. Therefore, the proactive desire to accept and gain profits and also the ability to casually apply to business help catching up with the above productive collaboration cycle. On the other hand, the attitude of only seeking for projects and chasing benefits from outside would never work in the long run. If we only talk about the design field, system and process for running an architectural project, it is the same everywhere but the essential of being able to pass the local regulations and specifications is its local network. Initially, a design firm might get commissioned on a project in Thailand and work from its home based office in own country. But in the future, if the movement of Asian architects becomes more prominent, that design office probably will plan to open an office in Thailand as well. Therefore, Thailand absorbs the good points of Japan and on the other hand Japan will also have to act and focus on efficiently utilizing certain special characteristics of Thailand or other Asian countries. For instance, Japanese architects should not miss their chances to use the international network of Thai firms or its association of the neighboring countries to get more overseas projects. In fact, recently they have already started to set foot from Thai base into new markets in their neighboring countries such as Myanmar. Business chances are emerging from this ever-expanding globalization, which is enabling us to be engaged in numerous architecture projects. In this light, we have to habitually make ourselves like an antenna that always seeks for information not only limited to the contents that relevant to architecture field anymore. The ability as architect, such as tough and active working, might no longer matter. Even though one cannot express oneself because of the language barrier but if he/she can use graphic language, a universal language, to skillfully express the idea or solution through drawing and be able to touch the heart of the client and partner, the balance of those sensation and ability to communicate will probably be the most valuable talent for an architect. I, as an international committee member of Association of Siamese Architects under Royal Patronage, have been participated in several Asia regional events such as JIA and ARCASIA convention. Those events are not just held for architects to present their works or do a seminar but sometimes we also deepen cross-boarder exchanges through playing golf or soccer, enjoying music or just simply dine together. What I have witnessed with my very own eyes is that those activities help us to form a mutual understanding between nations and establish strong network as true friends. Last but not least, I would like to introduce you the event “Architects’13”which had been recently held in Bangkok. 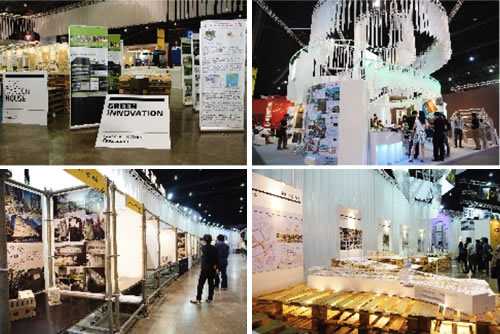 It is a big annual event organized by ASA for architects to share their works throughout the year as well as update their construction knowledge in the building material exhibition. This year, to celebrate the 27th anniversary of this event, ‘Borderless’ has been chosen as the theme for a number of design offices to share their vision toward this keyword. Yet, there are student exhibition, international design competition and also forum lectured by international guests (this year two guests were from Japan, Takaharu Tezuka and Jun Igarashi). The combination of those activities had made a magnificent 6-day-exhibition for any visitors. However, as to raise a ground for discussion in response to the up and coming AEC, the content and quality of event, which sponsored by the association of architects of each ASEAN countries have been organized, compete year by year. These are good chances for us to feel the energy of Asian architects; therefore, from next year onward, ASA will come up with events that can attract participants even from Japan. From now on, we will keep distributing useful information to you as a way of contribution to the development of our Asian architects. Bangkok Mass Transit System Expansion, etc.